How did you capture such an awesome photo! Sunrise in the beautiful Sossusvlei, Namibia. Very early in the morning. Left my Campsite at Sesriem around 04.00 in the morning. Drove close to 1h to get to the Parking Area at Sossusvlei. Packed my Camera, Lenses and Tripod in my Backpack and walkedd for about 30min in the sand to get to this place. Just on time to get the picture with the first Sunrays. Very early in the morning or late evening - close to Sunset is the best time to take pictures at Sossuvlei. Sunrise and Sunset is very intensive and the sand is "glowing". Canon 7D MarkII Canon 16-35mm Lense with Manfrotto Tripod. The Namib Desert for me is one of the intensest places nature can share. Brilliant shapes and shades during Sunset and Sunrise. The Sound of Silence in the Dunes is spectacular. A bit of color grading in lightroom was enought for that picture. My Canon 7D MarkII, Lenses 16-35, Tamron 24-70, 70-200mm and for Wildlife photography my Sigma 150-600mm! 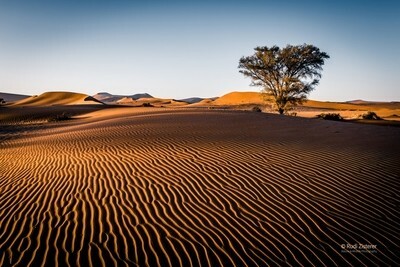 Southern Africa - Namibia is a great country for photographing Nature and Wildlife. Easy to travel, lovely and nice people. Love to stay out in the wild. If you like to do this go very early in the morning or late evening (best light)!